O-mikuji (御御籤, 御神籤, or おみくじ, o-mikuji) are random fortunes written on strips of paper at Shinto shrines and Buddhist temples in Japan. Literally "sacred lot", these are usually received by making a small offering (generally a five-yen coin as it is considered good luck) and randomly choosing one from a box, hoping for the resulting fortune to be good. As of 2011[update] coin-slot machines sometimes dispense o-mikuji. The o-mikuji predicts the person's chances of his or her hopes coming true, of finding a good match, or generally matters of health, fortune, life, etc. 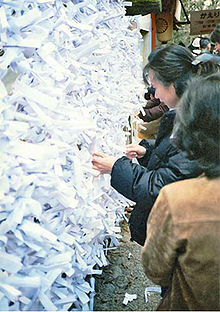 When the prediction is bad, it is a custom to fold up the strip of paper and attach it to a pine tree or a wall of metal wires alongside other bad fortunes in the temple or shrine grounds. A purported reason for this custom is a pun on the word for pine tree (松 matsu) and the verb 'to wait' (待つ matsu), the idea being that the bad luck will wait by the tree rather than attach itself to the bearer. In the event of the fortune being good, the bearer has two options: he or she can also tie it to the tree or wires so that the fortune has a greater effect or he or she can keep it for luck. 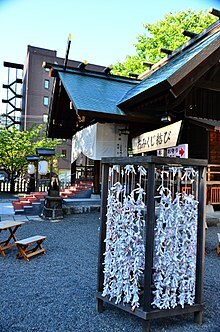 O-mikuji are available at most shrines, and remain one of the traditional activities related to shrine-going. Compare perhaps the custom of writing a prayer on a specially-prepared wooden block called an ema, which is then tied to an ad hoc scaffold. The random fortunes in fortune cookies may be derived from o-mikuji; this is claimed by Seiichi Kito of Fugetsu-Do, and supported by evidence that American fortune cookies derive from 19th century Kyoto cookies. ^ Lee, Jennifer 8. (January 16, 2008). "Solving a Riddle Wrapped in a Mystery Inside a Cookie" "feb 24 2004 how to see your fortune the fortune cookie" The New York Times. Retrieved on January 16, 2008. Wikimedia Commons has media related to Omikuji.